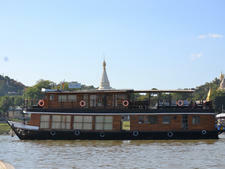 The second largest boat in the four-strong fleet owned by the Tint Tint Myanmar company offers plenty of space for passengers who want to explore sections of the Irrawaddy in Myanmar (Burma) on short itineraries. 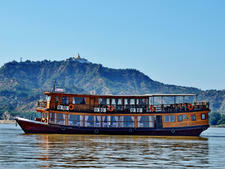 It sails on one- and two-night cruises between Mandalay and Bagan, with excursions taking in sights such as the Yandabo pottery village, famous for its production of terracotta using clay from the riverbank. 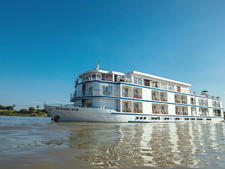 Irrawaddy Princess II offers high levels of service, with a 1:2 crew-to-passenger ratio. There are 20 cabins, with 18 on the Main Deck and Upper Deck and two suites situated on the top Sun Deck. All cabins have a private bathroom with shower, mini-bar and complimentary bottled water. Standard cabins measure between 205 and 215 square feet and are a mix of double and twins. The two suites, with fixed double beds, each measure 320 square feet. The ship is decorated in traditional style, with extensive use of wood and comfortable rattan chairs. The restaurant on the upper deck services Burman, Chinese and Western dishes. Complimentary tea and coffee is available throughout the day. Other beverages from the bar menu are charged to passengers' accounts. Facilities include a Sun Deck bar and a spa room. This 12-passenger vessel built in traditional style is one of four owned by Tint Tint Myanmar that sails on the Irrawaddy in Myanmar.